Although I have a soft spot for Irish food (and Ireland in general), it usually takes the thought of March on the horizon and the imminent arrival of St. Paddy's Day before I consciously think about cooking up some traditional food...triggering a towering stack of Irish cookbooks, old photos and notes from my trip to Ireland, and endless internet scouting. 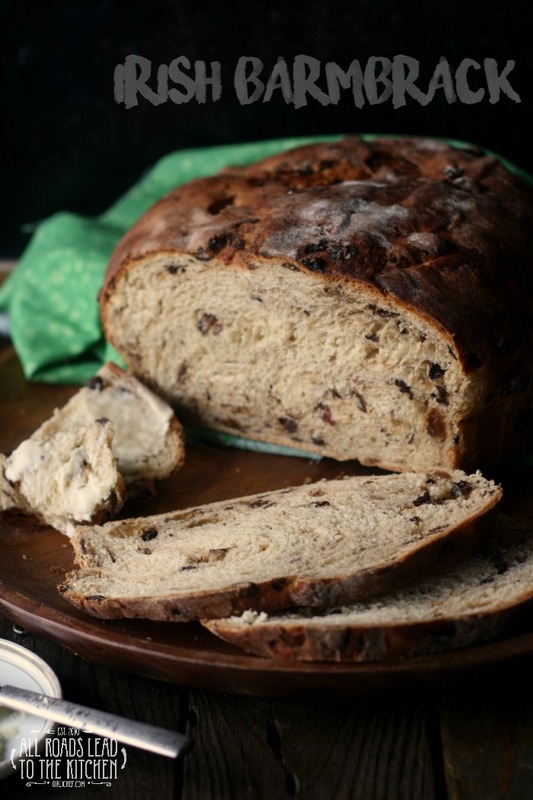 I have a few Irish foods ready to share over the next couple of weeks, starting today with a loaf of Irish Barmbrack as part of Twelve Loaves (our theme is Irish Breads). The word barm comes from beorma, an old English word that means yeasty fermented liquor, while brack (or brac) is the Irish word for speckled. And so it is a yeasty bread that is speckled with dried fruit, and often candied peel. It's also known by the names Barnbrack, Báirín Breac, Boreen brack, Bawreen brack, or simply brack. 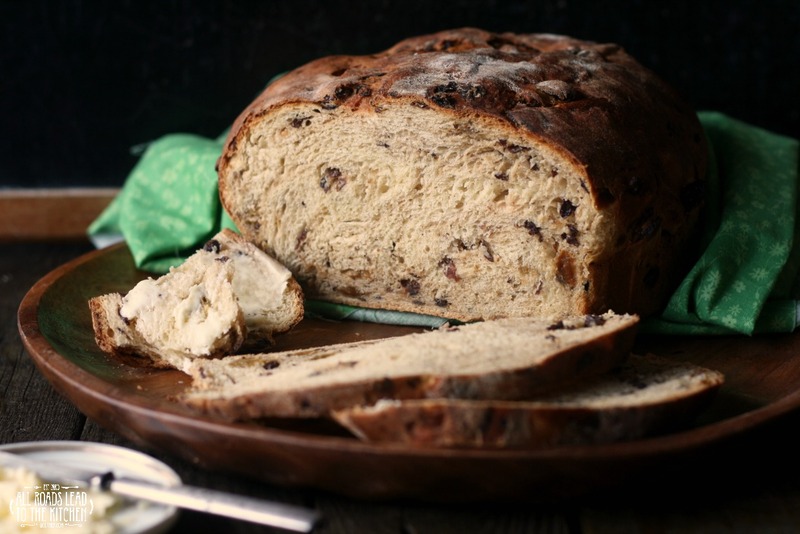 Barmbrack is traditionally associated with Hallowe'en and Samhain, a Gaelic festival that marks the end of harvest season and the beginning of the darker half of the year, and is celebrated from sunset on October 31 to sunset on November 1. It was used as a means of telling your fortune for the year to come. People tucked various objects into the dough before baking and the object you found in your slice predicted your fate for the year. The slice with the ring baked in symbolized that you would marry within the year, a coin symbolized good fortune or riches, a stick signaled that you would have an unhappy marriage or always be in disputes, a rag or piece of cloth meant you would have bad luck, and a pea or thimble symbolized spinsterhood (or the equivalent for a man). 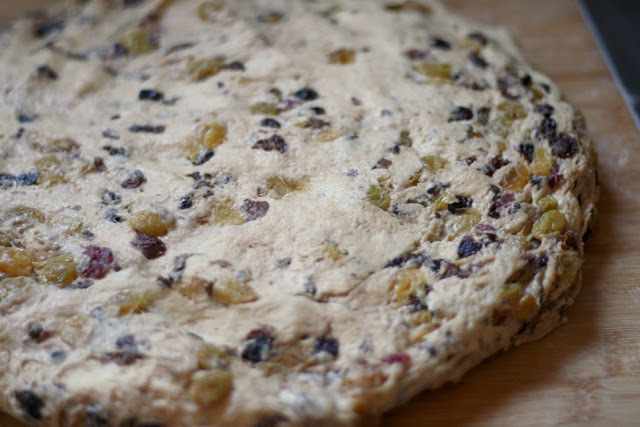 There are all sorts of recipes floating around for Barmbrack. While the name itself signifies that there is yeast in it, I've seen plenty without, that seem more cake-like. Some are laden with spice and some light-handed (like I was), some have only raisins while others have candied peel and/or other dried or candied fruits throughout. I saw one that was brushed with honey during the last couple minutes of baking and a couple that were finished with a glaze. Pretty much all of the versions looked tasty in their own right, but the loaf that inspired and was the basis for mine comes from Seasons & Suppers. I loved the heft and height of the authors rustic loaf, and knew that it would be well received in my house. I didn't tuck any treasures into mine...this time. But I love the idea of including them and baking a yearly loaf as a Halloween tradition. The fire was nice and bright and on one of the side-tables were four very big barmbracks. These barmbracks seemed uncut; but if you went closer you would see that they had been cut into long thick even slices and were ready to be handed round at tea. This spiced Irish bread is studded with dried fruit that's been plumped in black tea. Treasures can be baked inside for a fortune telling game traditionally associated with Samhain (Hallowe'en). 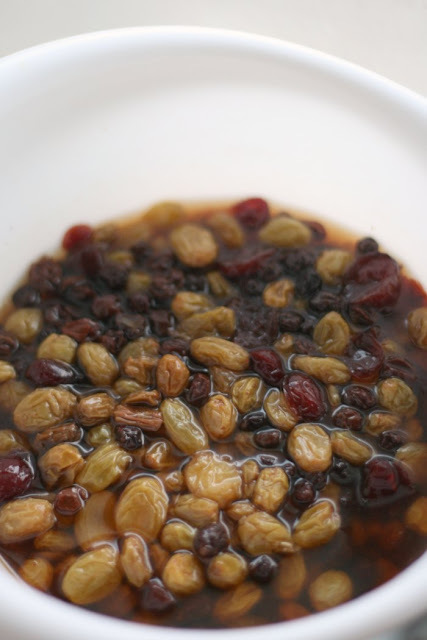 Place the golden raisins and currants in a small-medium bowl and pour the warm tea over them. Cover and allow to sit on the counter at a cool room temperature overnight (or about 12 hours). Tip the raisins and currants into a medium-mesh strainer and allow to drain for a few minutes. Toss them with about 2 teaspoons of extra flour; set aside for the moment. Place the remaining ingredients into the bowl of an electric mixer fitted with the dough hook. Turn on low and mix until everything comes together. Increase speed (medium to medium-high) and let the dough knead for 10 minutes. At this point, though dough should be smooth and just slightly tacky. Now you're going to mess it all up by adding the fruit to the bowl. It's going to turn into a gluey mess - but don't worry, we'll fix it. 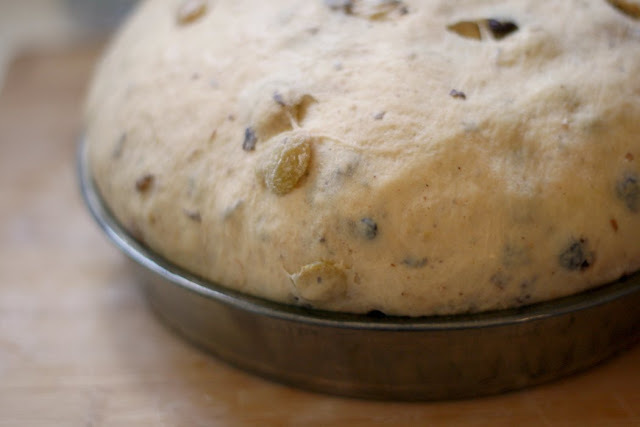 With the mixer running on medium, sprinkle in a tablespoon of extra flour at a time until the dough has incorporated the fruit into it, once again forming a cohesive dough that is tacky, but not super sticky (you should be able to plunge your finger into it and come away with only the slightest hint of dough on it). Don't rush this part and add too much flour or your dough will be dry; you will wind up needing approximately another 65 to 130 grams (1/2 to 1 cup). You should be able to reach into the mixing bowl and form the dough into a ball without it dough getting stuck to every part of your hand that it touches - just a few tacky bits are good, though. Set dough ball into a large bowl that has been lightly oiled. Cover with plastic wrap or a clean kitchen towel and allow to rise at room temperature until doubled in size, about 1 hour. Preheat oven to 400° F. Grease an 8-inch pan. Turn the dough out onto a lightly floured work surface and press gently to release some of the built up gas. Form into a ball and set into prepared pan. Cover loosely with plastic wrap or a clean kitchen towel and allow to rise until doubled in size, 20-30 minutes. Remove plastic and place into preheated oven for 40-45 minutes. Check halfway through baking time and tent loosely with foil if the bread is getting too dark. Finished loaf should register at least 195° on a thermometer that has been inserted into the center. Turn out onto a wire rack and allow to cool completely before slicing. 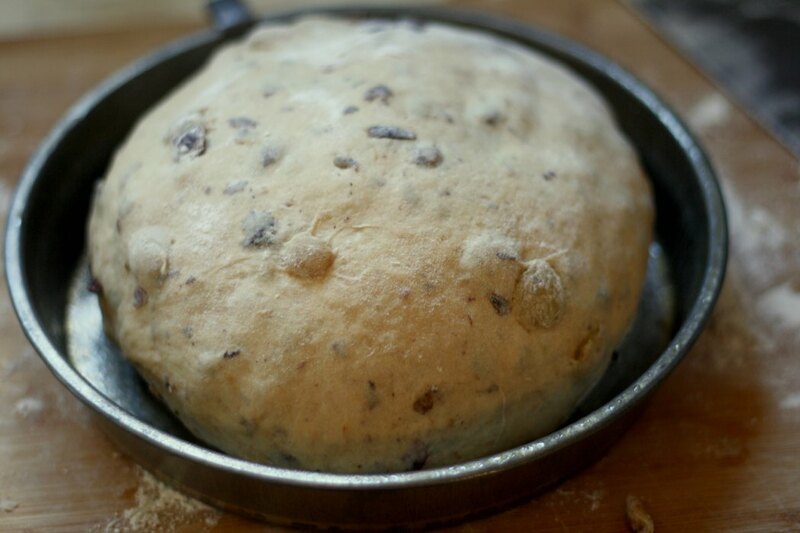 Hungry for a few more Irish bread recipes? 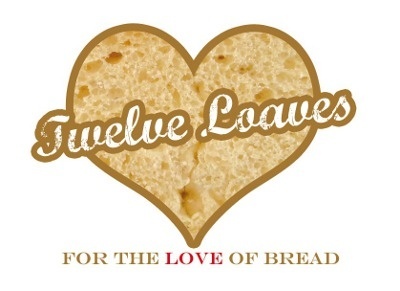 #TwelveLoaves is a monthly bread baking party created by Lora from Savoring Italy and runs smoothly with the help of Heather of All Roads Lead to the Kitchen, and the rest of our fabulous bakers. This month we are baking Irish Breads. For more bread recipes, visit the #TwelveLoaves Pinterest board, or check out last month's inspiring selection of #TwelveLoaves RED Breads! If you'd like to bake along with us this month, share your Irish Breads using hashtag #TwelveLoaves!